One of the common ways of saying ‘again’ in Italian is ‘di nuovo’, which carries the sense of newness in a repetition (‘nuovo’ meaning ‘new’). That is exactly how I feel in rediscovering with wonder this experience of welcome. And, more generally, in returning to this special place. This photo, you will have noticed, is of the same view that I take each time I arrive, the view down my street to the main piazza with the statue of Garibaldi, the view into the Tiber valley across to Sansepolcro. Every time I see it, it is di nuovo. And it’s the changes in light that particularly make this a different view every time I walk down the street. This photo was taken on arrival, at passeggiata time. A bright patch of light had just appeared through the clouds on the hills across the valley. I fall easily into my daily Anghiari routine, but I find there have been changes in the past year. Previously I’ve said that one of the things I love about this place is the sense of continuity in everyday rituals, and that there are always the same people in the same shops. But things do change. The butcher of the annual pork festival has closed (apparently the son has opened a shop in another town). And Letizia’s fruit and vegetable shop has closed. This is particularly sad for me because it was always the big hug from Letizia that made me feel I had really arrived here. My daily trip to her shop has always been an integral part of my Anghiari life. There is now only one vegetable shop left, and one butcher. 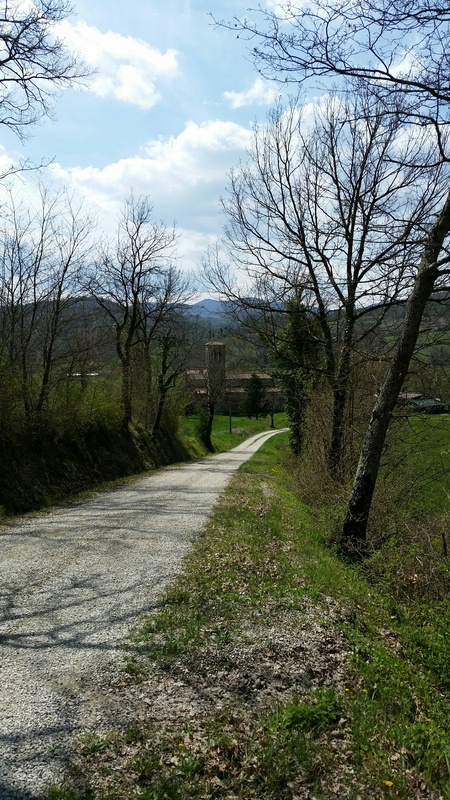 When I started coming to Anghiari 16 years ago, there were about five of each. The weekly market on Wednesdays continues, but, increasingly, people go to the shopping centre on the outskirts of Sansepolcro for food shopping. The remaining small fruit and vegetable shop, next to the Talozzi restaurant, does have lovely local fresh vegetables, as Letizia’s did. And, after a long journey, it was a pleasure to be carrying back up the hill, fresh young broad beans, asparagus and artichokes, for my first meal here. A lovely simple, spring dish. The shops that do remain seem full and lively as ever. When I visit the butcher’s the next day, it is full of people patiently waiting their turn. This butcher has been here, in the piazza, for a very long time, and I guess there isn’t the issue of loyalty anymore. Then there’s the panificio, with the same people and the same inviting smell of fresh bread and colomba for easter; and young Matteo in the Tutto shop two doors down, who is excited to tell me that, on finishing his hospitality course, he worked in the Ritz in London for three months; and Angela is there, in the newsagent, so we resume our conversations about the daily news. Milva and Lorenzo,mother and son in the alimentari, are very happy to see me again, and remember exactly what food and wine I like. After my morning round of shops, I head to the Caffé Garibaldi, and then back up the hill. Today, the sun has come out, and I have just returned home after a very warm greeting in the piazza from Paola, the lovely street cleaner whom I interviewed last year. We talked about the process of change in the town, and the shops closing. 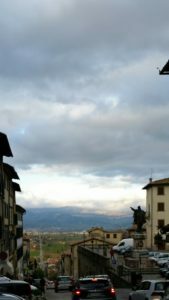 She fears that, sadly, Anghiari is becoming a museum, that, like other nearby towns, the spirit of the community is dying. She says that, with young people leaving, the town is aging; that there is no longer the same street life that once animated the town; and that, with fewer shops, people are not meeting as much in that everyday sort of way. Nevertheless, we have just had a very lively meeting, in the street. The street life still seems pretty lively to me. 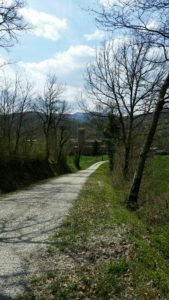 I decide to head off on a walk in this lovely sun, into the Sovara valley, the valley on the other side of Anghiari, where there is a beautiful 11th century Romanesque church. The air is full of the buzz of bees in blossom and birds singing. Red poppies line the side of the road. It is so peaceful, and still. Tonight, a local early music ensemble will be performing a concert for holy week in La Propositura, the church from where the bells are ringing right now. lovely to read your thoughts from Anghiari again…we were at Bondi yesterday and thought of you, it was a perfect Autumn day…our Indian Summer with many swimmers. Ann, you describe both an idyllic scene and a widespread concern. I can almost taste the produce you have purchased – those lovely broad beans, asparagus and artichokes! Thank you for that. But I can also feel the distressing change in towns where there is consolidation of vendors and a drift toward purchase in (or, even more extremely, movement to) larger (cheaper, less holistic?) regional centres. I hope for a resurgence of appreciation of regional values.